Nobody makes delicate, intricate jewelry like Sonya Renee. I discovered her on YouTube, and after my fiance purchased the "amazing studs" from Lorraine, I became hooked. The Current Custom only sells a tiny amount of Sonya Renee jewelry, so I highly recommend going to the actual site in order to really see just how many beautiful pieces they sell. These gorgeous CZ studs are by far my most worn earrings. Last week, I decided to finally place another order after holding off and stalking the site for months. In general, Sonya Renee pieces aren't expensive, so I'm not sure why I waited so long to get the items I had been wanting. Again, I was throughly impressed with the quality and attention to detail. They come in other colors too! The chain is 16" long, and the initial itself is really sweet and tiny. It would be great to layer, but I'll probably wear it mostly on its own. I love it. 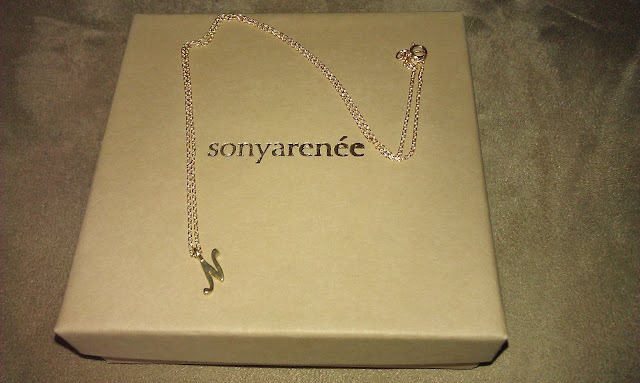 It can stand for my name, or for the boy since our names both start with "N". I love Sonya Renee! I bought all of my bridesmaids their wedding jewelry from there -- all different gold and pearl drop earrings. I only wish I'd bought myself a pair, too! Ok those earrings are lovely and may have to order them. I love the earrings...both pair! I will have to check out the site. I'm always in the marker for a new pair of studs! oh these are super cute! LOVE all of them noelle! The pieces are beautiful! I especially like the letter necklace. So cute that both of your names start with "N". btw, I think I recognize that rose sweater...wanted it for myself but it was a little big on me. I love the first earrings -- so simple and super chic. Thank you girls! Check out the site! I seem to have a running wishlist :) The earrings are the perfect size - not too big, but not too small either. If you love studs as much as I do, a fun bright pair like these are great to switch things up. 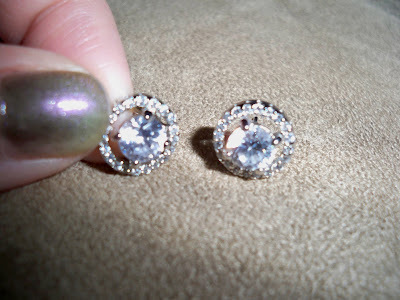 A good change from my usual silver ball studs/Chanels. And the initial necklace is so cute. If you have a child, I think getting their initial would be really nice. Those earrings are beautiful! I've never heard of this line before but I just browsed the website and there are lots of things I like! I was wearing an O.P.I color...the one that came out with the Katy Perry collection! I forget the name! 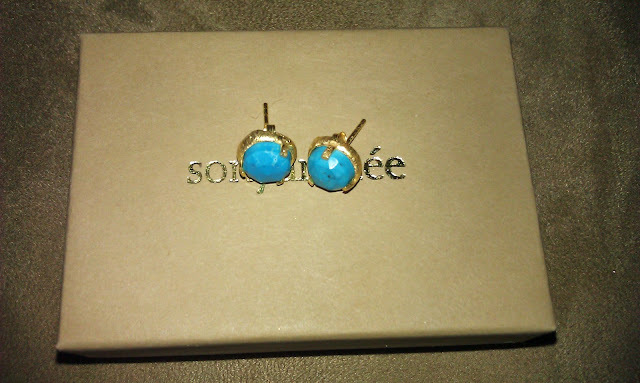 Those earrings are amazing, I loved them when you first blogged about them and now I love them even more! The turquoise is gorgeous. 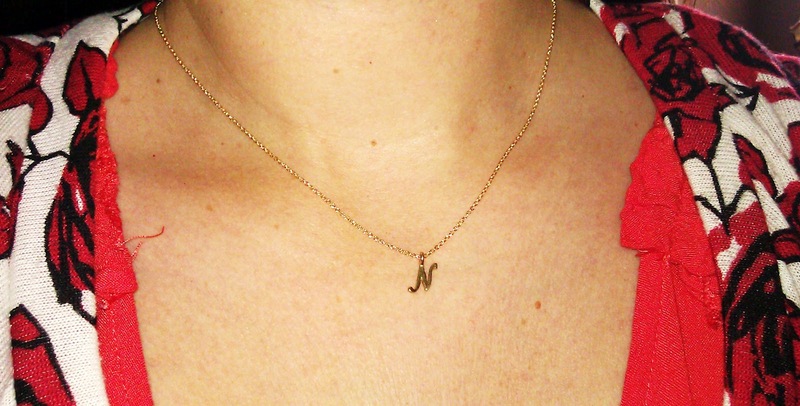 Love the monogram necklace too, how convenient you and your FI both have "N" names! Very nice! Are those first studs connected or are they jackets?